For the server, I used a PHP/MySQL REST interface, and wrote a very thin client in Codename One. Both the server and client project are on GitHub so you can review it and install it yourself on your own server. I decided to port this app to Parse.com as a proof-of-concept. 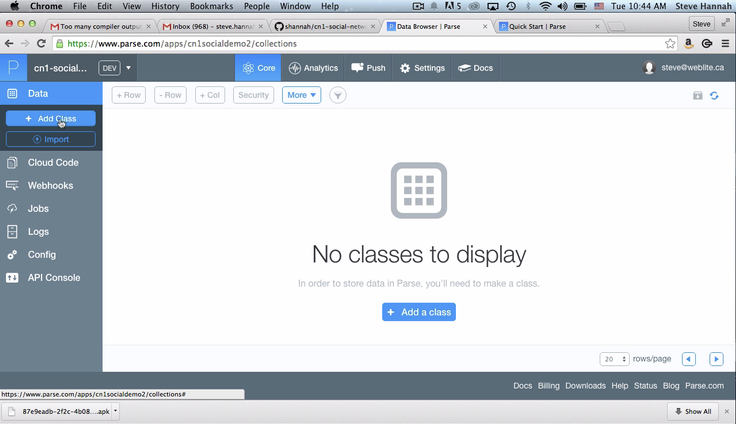 Parse.com is like a back-end in a box. You get a highly scalable REST server and NoSQL database without having to manage it yourself. This allows you to focus on your Codename one client app - making it slick and beautiful. No worries about scaling, server software patches, or any of that noise. Just the app. I particularly like the fact that Parse.com is free for apps that get a small amount of traffic (up to 30 requests per second). As your app grows, you just pay for the added bandwidth. I started with a fully functional app. The only portion of the Codename One app that required changes was the SocialClient class, which is where all of the interaction with the server happened. Implement a thin REST interface for my data using Parse’s cloud functions. To interact with the PHP/MySQL back-end this API was implemented directly on top of ConnectionRequest and the NetworkManager to issue HTTP GET and POST requests directly to the server. JSON was used to transmit the response back from the server to the client, and this was converted into `Map`s and `List`s. You’ll notice that this API does not make use of Java’s strong typing…​ I’m just using lists and maps. This was for flexibility while I was fleshing out the API. At some point, in a real-world app, I would probably refactor to use some custom Java types. For the Parse back-end we could also just write a thin REST client on top of ConnectionRequest, but there is an easier way, thanks to Chidiebere Okwudire’s parse4cn1 cn1lib, which wraps the Parse REST API providing a Java API that is very similar to the official Parse Java API. For the Parse data model, my first instinct was to just create a class for each table. However, I discovered that that a one-to-one mapping was not ideal. This is due, in part, to the fact that Parse already provides some of the functionality out of the box, and also that Parse’s database is not relational as MySQL is. Parse supports relations but they work a little bit different than they do in a relational database like MySQL. We’ll explore the differences in more detail later. User - For user accounts. I folded the profile table data into this single class as well to simplify the model. Post - For news items posted by users. 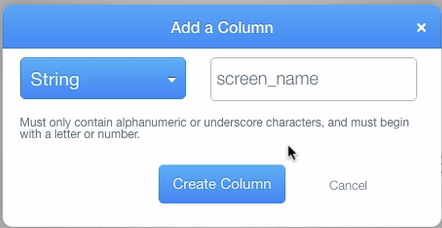 Create screen_name column. 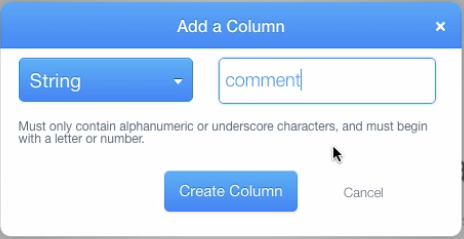 Click the "+ Col" button on the top menu. I also ended up creating an Upload class but this was purely to help with file uploads, and is not part of the conceptual design. Aren’t we missing a lot of tables?!! The sessions table is no longer necessary in Parse because Parse takes care of all aspects of user registration, login, and session management. As mentioned before, I just folded the profiles data directly into the User class. This was for simplicity and to minimize the number of data requests to obtain profile data. The friends and friend_requests tables were join tables meant to relate users to each other. In Parse, we handle this by adding a column of type Relation to our classes. E.g. The User class has a friends relation and an pendingFriendRequests relation that provide equivalent functionality to the friends and friend_requests tables. Pointer - A type you can use for adding a reference to a single record in that column. E.g. If you wanted to track if a User was the parent of another User, you might add a column named "parent" to the "User" class with type "Pointer". Relation - A type used for storing references to multiple records in that column. E.g. If you wanted to track all of the children of a User, you might add a column to the "User" class named "children" with type "Relation". Whether there is a pending friend request from one to the other. So I added a columns named "friends" and "pendingFriendRequests" to the "User" class, both with type "Relation". Relationships are one-way only. E.g. If you add "Steve" to the friends relation of "Doug", then that does not automatically add "Doug" to "Steve"'s friends relation. For the "pendingFriendRequests" relationship this is what we want anyways, but for the "friends" relationship we wanted it to be two-way, so we need to add Steve to Doug and Doug to Steve when making them friends. Now that we have our database set up, let’s try to connect to it from our Codename one app. The first thing that we need to do is download and install the parse4cn1 library. You can download it from here. Copy the parse4cn1.cn1lib file into your project’s lib directory, then select "Refresh" libs (i.e. right click on the project > "Codename One" > Refresh Libs). You will also need to install the CN1JSON library which the parse4cn1 library depends on. The Application ID and client key can be found in the "Keys" tab when logged in to Parse.com. Make sure to use the "Client Key" and not the "REST API Key" or "Master Key" when connecting to Parse from a client device, as is most likely the case with Codename One apps. The REST API key and Master Key provide full permissions to your database and should not be embedded anywhere in your app for security reasons. These keys are for use in secure settings like a server-side application that connects to your parse application. The implementation of the login method for our REST client is as follows. User registration is very similar to logging in. It just uses the ParseUser.signUp() method instead of ParseUser.login(). The Parse API provides support for CRUD (Create-Read-Update-Delete) directly from the client to the data source. For security it supports ACLs at both the class-level and the object level. Therefore, if you set up your ACLs appropriately, you could interact with the database directly from your Codename one client app. You can see API examples on the parse4cn1 wiki. Offering direct database access to the client makes the app very difficult to secure. Any server-side engineer worth a salt know that YOU CANNOT TRUST THE CLIENT. If you want actions to be available to some users but not others - and they are using the same client app, then you need to be very careful about the ACLs that you use in your database. Some operations may require multiple database requests which can slow the app down. Better to just send a single request to the parse server, and let server-side code handle the multiple queries. 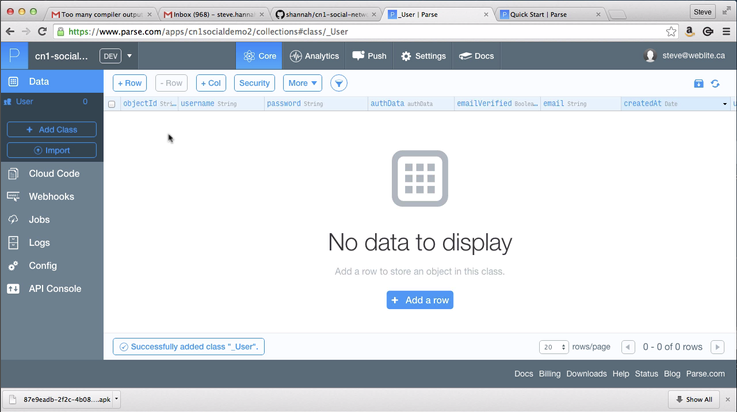 Parse allows you to implement server-side REST web services, known as "cloud code". Because this code is running on the server side, you can allow them to run with the master key - so you don’t have to rely on ACLs to limit access to records and classes. You can use your own logic to decide who can do what. This model maps more closely to running your own server and provides more control. AND it allows you to lock down your database so you don’t need to provide direct access to clients. Please log in to Parse using your email and password. Next we will create a directory to hold your Cloud Code. or hit ENTER to use "Social Demo" as the directory name. Your Cloud Code has been created at /Users/shannah/cn1_files/incubator/social-network-parse/social-demo-parse-2. Next, you might want to deploy this code with "parse deploy". // Use Parse.Cloud.define to define as many cloud functions as you want. That way the client can always check the "code" property to find out if the action was successful. No return value. E.g. accept_friend_request, send_friend_request. Returns a list of objects. E.g. find_users, get_friends, etc..
* Calls cloud code function with void return type. * @param funcName The name of the function to call. * @param params Parameters passed to the function. Accepts null. * Calls a cloud code function whose result will be a list of objects. * @param funcName The name of the cloud code function to call. * @param params Parameters passed to the cloud code. Accepts null. *  were returned by the cloud code. * Calls cloud code function that returns a single object. * @param params Parameters passed to the cloud code function. Accepts null. * was returned from the cloud code function. For convenience I also created thin wrappers around these utility functions to be able to pass an array objects for the parameters instead of a Map. Now that we have the foundation in place for the server and client sides of the REST API, let’s flesh it out a little bit more to see exactly how the code will look on both the server-side and client-side. Take the getFeed() method, for example, that is meant to return a list of the posts that should appear in the current user’s news feed. Parse.Cloud.useMasterKey() gives us carte blanche on the parse API. We don’t have any security restrictions. Without this all access would be subject to security restrictions on the currently logged in user. Creates a query on the User class for all users with "username" equal to the "username" parameter passed as part of the request. The each() method then iterates over the results with the provided callback. Adds the current user to the "pendingFriendRequests" relation of the found user. We save the user object. save() returns a promise so that calling then() will result in us being able to defer what comes next until the save is complete. If you’re not familiar with promises, it’s really just cute syntax for a callback. This finally returns the response to the client as a JSON object. Iterate through the results to build a JSON response. Some queries, especially queries involving complex relations like the one in get_feed were a little bit tricky to figure out, but in the end I was impressed by the Parse’s flexibility in being able to support quite complex queries. I won’t delve into the details here, but I will note that Parse’s documentation is exceptional and it seems to have quite a large user base, judging by the number of questions & answers related to parse that are already available online in their forums and elsewhere. I scarcely had to spend more than 5 minutes of googling to find the answer to my questions when I got stuck. The full project, both the Codename One client project and the parse cloud code are posted on Github to you can download and build the project yourself.